Round 1 in pattern measures 3/4″ (2 cm) in diameter. Use thread to sew the leaves and berries together in a layered triangle. 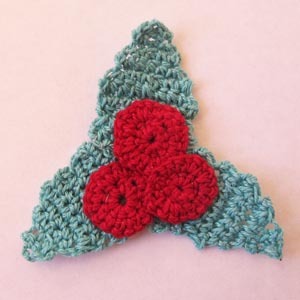 This entry was posted on Tuesday, December 6th, 2011 at 12:00 AM by Emilee Gettle	and is filed under Free Crochet Patterns. You can follow any responses to this entry through the RSS 2.0 feed. You can leave a response, or trackback from your own site. Gotta Love Holly! My Favorite! Thanks for the neat pattern!! Hi: I am a new crocheter and just want to know how to start a round rug using the single crochet stitch. I understand that you start with 2 chains – and then what? Your help would be SO appreciated. Whoops, I meant to say you start with 3 chains and then turn it over. You can start with the pattern, and then add more rounds to make it as big as you want.